There’s no evidence to suggest otherwise at this time. Though Houston is not in any danger of reclaiming the unenviable title of “murder capital of the United States,” murders in the city jumped 17 percent during the first six months of this year compared to the same period last year. There were 105 murders from January through June, up from 90 in the same time frame in 2011. That pace is nowhere near the record-setting year of 1981, when there were a whopping 701 killings in the city. Robberies, meanwhile, also spiked significantly in the first six months of this year – up 18 percent, police records show. Authorities say the murder and robbery rates are below other years and believe that crime initiatives in targeted areas have started pulling the numbers back down in the last three months. 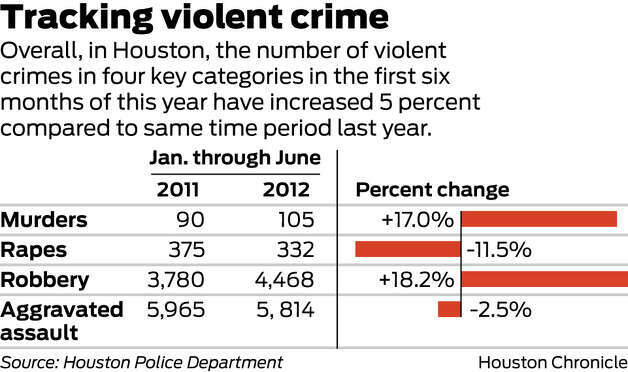 Murders and violent crime began dropping dramatically in Houston and other large U.S. cities in the 1990s. That trend culminated last year when murders dropped to 198 in Houston, the lowest since 1965. The story is based on a comparison of the first six months of 2011 to the first six months of 2012. But if there were 198 murders committed in Houston last year and 90 of them were in January through June, then there were 108 murders in the last six months of 2011, which is three more than were committed through June this year. Change the time period for comparison and you change the perception of the data. As an expert quoted in the story said, and as I suggested last year, a bump in the numbers this year doesn’t mean anything. We could still be in the midst of a long-term decrease in the murder rate, or we could be settled at the bottom of that decline. A small variation from one year to the next doesn’t really tell us anything.